A complete lesson with printable patterns is available to members on The Resource Room and as an instant download. Instant Download KJV Bible Lesson - $2.95 All the crafts and games on this page are included. Print cards onto card stock, write the Bible verse on the cards and make copies. God knows what is good for us even if we don't. Sometimes it seems like God isn't listening to us or answering our prayers like we want him to, but God knows what is best for us. He knows exactly what we need and when we need it. 1. Before class prepare the rice. Add a few drops of green food coloring and about 1/2 teaspoon of rubbing alcohol to two cups of rice. Mix them together to dye the rice. Add more food coloring or alcohol if needed. Spread the dyed rice out on paper towels to dry. Print out the Activity Sheet and make copies. 2. In class have your children color the picture and then stick or glue on flowers. 3. Once your children have colored and glued on all the flowers they want, they can add the green rice for grass. Show your children how to spread a light coating of glue over the areas they want to add the rice. Then sprinkle on the rice to finish. This coloring sheet is the same as the activity sheet above except it comes with grass and flowers. As your children color ask them why they think a shepherd might make his sheep lie down in green pastures. Preparation: Put your sheep puppet in a duffel bag or sack before class. Draw a picture of a sheep that Woolie can bring out. Teacher: Woolie what are you doing in here? Were you sleeping? (Pick Woolie up and have her stretch.) Woolie it is time for Sunday school. You don't want to sleep through Sunday school, do you? (Woolie shakes her head no.) Woolie, why are you so tried? Didn't you get enough rest? Sheep: (Woolie shakes her head no.) She brings out a picture of her friend. Teacher: Oh, that is your friend, Fluffy. Did you stay with Fluffy's flock last night? Teacher: Oh, that explains it. Fluffy doesn't have a good shepherd like you. Her shepherd lets her stay up all night long if she wants. The sheep in her flock are very noisy, fighting, and upset most of the time. (Woolie shakes her head yes and starts to fall asleep. Make her head gradually fall forward.) Her shepherd forgets about the sheep and doesn't care that they are fighting and upset. Aren't you glad you have a good shepherd Woolie? Woolie? Woolie, wake up! Teacher: I said, "Aren't you glad you have a good shepherd?" Last week we talked about how David wrote a poem called the 23rd Psalm. It tells us that God is a lot like a good shepherd who takes care of his sheep. Does anyone remember where we find the 23rd Psalm in the Bible? Yes, it is near the middle of the Bible. (Let a child come up and try to find the 23rd Psalm in your Bible. In the second verse (Open your Bible to Psalm 23:2 and read the verse.) It says, "He maketh me to lie down in green pastures: he leadeth me beside the still waters." Has your mom ever made you go to bed when you really didn't want to? I bet most of you have to go to bed before you really want to. Is your mom being mean to you? No, she makes you go to bed because she loves you. She wants you to get lots of rest so you won't be tired the next day. She knows that if you don't get enough rest, you can get sick a lot easier and you can't concentrate as well, and you get into more fights because you are tired. A good shepherd makes his sheep lay down and rest because he knows that they need rest just like we do. He watches over them and keeps them safe so they can be at peace and get lots of rest. God is a lot like a good shepherd. Sometimes we want things that are not good for us or that God thinks we don't need right now. Have you ever wondered why your prayers don't seem to get answered sometimes? Sometimes we ask him for things that he doesn't want us to have right now. He may say, "no" or he may say, "wait". A good shepherd leads his sheep to places that are safe. He doesn't just let them wonder where they want. He shows them where it is safe to get a drink of water. He doesn't take his sheep to a rapidly moving streams where they might fall in a drown. God is our shepherd. He is a good shepherd. He knows what is good for his sheep. He leads us through his words in the Bible. He gives us good advice about how to live. He also leads us through prayer and his Holy Spirit. He knows what is good for us. He may even let us go through some hard times because he wants us to learn to depend on him. But we can trust him that he makes everything work out for the good because he loves us. 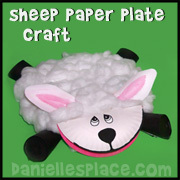 Children will love gluing cottom balls onto paper plates to make these adorable sheep. Go to Paper Plate Crafts Page on Danielle's Place for directions for this craft. 2. Cut the top off the cup to fit the head pattern. Tape the pattern onto the paper cup matching the edge of the pattern to the bottom edge of the paper cup. 3. Fold down the ears. 4. Print out the Background Pattern onto green paper. 5. Cut the cotton balls in half so they are thinner and go farther. 6. In class have your children glue cotton balls onto the sheep pattern, draw a face on the cup, color the legs with white crayons or colored pencils, and glue a pink pompom on for the nose. Then have them glue the cup head to the pattern page. Before class blow up ten balloons and draw faces on them for sheep. Roll up several layers of newspapers to make a "Shepherd's staff" and tape them closed. 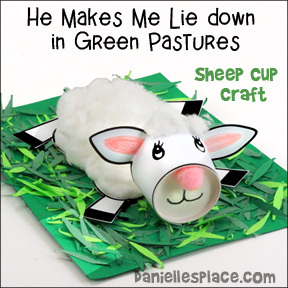 Spread out a green blanket or green paper at each end of the room for the "green pastures". Place the balloon sheep in the middle of the room on the floor. Pick two children to be the shepherds and give them each a "staff". Designate them each a pasture at one end of the room. Before each round remind the children that their sheep need rest and they should make their sheep lie down in the green pastures. 1. Before class prepare the Psalms 23:1-2 verse cube. 3. In class have the children roll the cube. 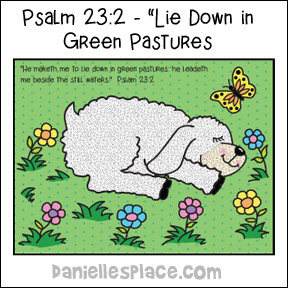 If a green side is facing up, the child should say the first part of Psalm 23:2 verse, "He maketh me to lie down in green pastures." If a blue side is facing up, the child should say the second part of Psalm 23:2, "He leadeth me beside the still waters." 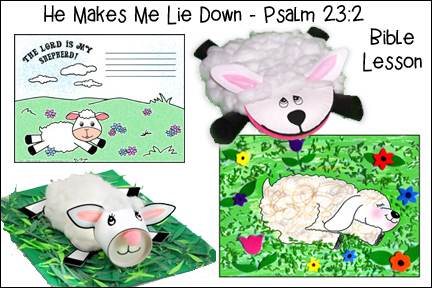 If the picture of the sheep is facing up, the child should say Psalms 23:1. If you have very young children, you may want to make the verses easier to remember. They can say something like, "still waters" or "green pastures" You can then say the complete verse for them. Children pretend to by shepherds and lead their sheep to green pastures in this mini golf game. Easy to prepare, just cut and glue the images to a piece of folded paper to make the fairway. Children push a plastic golf ball with a drinking straw club to try and get it in the hole. (Patterns available to members and as an instant download with the Bible lesson above or as a single digital down load on the Bible Mini Golf Course Page. Sing to the tune of "Up on the House Top"
Snap you fingers and tap your toes. Oh, Psalms 23:2 tells this story. Won't you come listen and learn. Copyright © 2004 Digital by Design Inc. This week I am going to do a second "Sheep" lesson. I have a tongue twister object lesson that I am going to have them say, which I attached below. Depending on age of children, the leader may want to say a few times or have older children try to read it. Swanson Christian Supply Toy Plush Lamb With Sweater Lord Is My Shepherd 9.5 In.